Viewpoint ProContractor is an all-in-one, comprehensive solution for construction project management which also enables estimating and accounting. You can use it as your construction bidding software to gain leverage in the construction bidding phase and win projects, as well as maintain your databases to achieve accurate takeoffs. Viewpoint ProContractor aids general, masonry, and earthwork contractors to produce seamless estimates and to manage projects from bidding to completion. This construction software streamlines important stages of project lifecycles which are estimating and cost tracking through its digital takeoff functionality and centralized database. The system is priced by quote, which means that each user receives a package tailored to his needs. A major feature of Viewpoint ProContractor is how it automates and speeds up estimating.To eliminate the process of working on blueprints manually, Viewpoint ProContractor provides a functionality that allows users to manipulate sophisticated verification built-in tools as they prepare and check estimates. It uses 3D visuals to have a comprehensive view of projects and helps contractors determine the material, equipment, and labor cost. In case there are errors, they can easily be pinpointed and the necessary adjustments can be applied avoiding added cost. This functionality improves accuracy in estimating. Project management is another distinguishing functionality of Viewpoint Contractor. As a project progresses, user can verify the actual labor and costs with the estimate since the information is centralized. Changes then can be made by updating the central cost list or creating a custom price book. The software has a drag and drop feature eliminating the duplication of data whenever there are changes or updates that need to be done such as updating the price of specific items. Job tracking tools are also provided to maximize contractors’ visibility and control to the progress of projects. If you are considering Viewpoint ProContractor it might also be a good idea to investigate other subcategories of Best Construction Management Software collected in our base of B2B software reviews. Every organization has different requirements and requires a system that can be personalized for their size, kind of workers and customers, and the specific industry they are in. For these reasons, no platform can provide perfect features out-of-the-box. When you look for a software system, first be sure what you need it for. Read some Viewpoint ProContractor reviews and ask yourself do you need basic functionality or do you want complex features? Are there any industry-specific features that you are seeking? Find the answers to these questions to assist your search. There are plenty of elements that you need to consider and these include your budget, specific business wants, your organization size, integration needs etc. Take your time, check out a few free trials, and finally zero in on the platform that presents all that you need to improve your company competence and productivity. How Much Does Viewpoint ProContractor Cost? Viewpoint ProContractor’s SMB and enterprise pricing information is available only upon request. Contact the company for more details, and ask for your quote. We realize that when you make a decision to buy Construction Management Software it’s important not only to see how experts evaluate it in their reviews, but also to find out if the real people and companies that buy it are actually satisfied with the product. That’s why we’ve created our behavior-based Customer Satisfaction Algorithm™ that gathers customer reviews, comments and Viewpoint ProContractor reviews across a wide range of social media sites. The data is then presented in an easy to digest form showing how many people had positive and negative experience with Viewpoint ProContractor. With that information at hand you should be equipped to make an informed buying decision that you won’t regret. What are Viewpoint ProContractor pricing details? 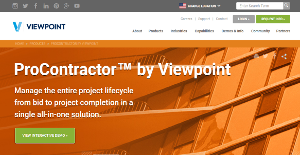 What integrations are available for Viewpoint ProContractor? If you need more information about Viewpoint ProContractor or you simply have a question let us know what you need and we’ll forward your request directly to the vendor.